Branded Customer Sportswear. Purple/Black Snap Back Cap. One size fits all. 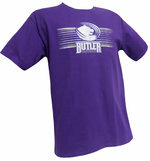 Black Cap imprinted with purple and white "Butler 1927" on front and "Grizzlies" in white on back. One size fits most. Black full zip hooded jacket with "BCC Butler" and the grizzly logo on the front. 80% polyester 20% cotton. 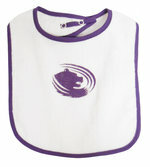 White terry bib with purple trim and the Grizzlie emblem imprinted in purple on the front. One size fits most. 100% cotton.